Two year old Yusef lives in the Domiz refugee camp in Northern Iraq with his two brothers, mother and grandmother. During the first seven years of life a child’s brain has the potential to activate 1,000 brain cells every second, UNICEF highlighted. Each one of those cells, known as neurons, has the power to connect to another 10,000 neurons thousands of times per second. Brain connections serve as the building blocks of a child’s future, defining their health, emotional well-being and ability to learn. Children living in conflict are often exposed to extreme trauma, putting them at risk of living in a state of toxic stress, a condition that inhibits brain cell connections—with significant life-long consequences to their cognitive, social and physical development, the agency added. “In addition to the immediate physical threats that children in crises face, they are also at risk of deep-rooted emotional scars,” UNICEF Chief of Early Child Development Pia Britto said in a press release. UNICEF figures show that globally one in 11 children aged six or younger has spent the most critical period of brain development growing up in conflict. “Conflict robs children of their safety, family and friends, play and routine. Yet these are all elements of childhood that give children the best possible chance of developing fully and learning effectively, enabling them to contribute to their economies and societies, and building strong and safe communities when they reach adulthood,” Ms. Britto said. “That is why we need to invest more to provide children and caregivers with critical supplies and services including learning materials, psychosocial support, and safe, child-friendly spaces that can help restore a sense of childhood in the midst of conflict,” she added. According to UNICEF, a child is born with 253 million functioning neurons, but whether the brain reaches its full adult capacity of around one billion connectable neurons depends in large part on early childhood development. This includes breastfeeding and early nutrition, early stimulation by caregivers, early learning opportunities and a chance to grow and play in a safe and healthy environment. As part of its response in humanitarian emergencies and protracted crises, UNICEF underlined that it works to keep children in child-friendly environments, providing emergency kits with learning and play materials. These have reportedly supported more than 800,000 children living in emergency contexts in the past year alone. 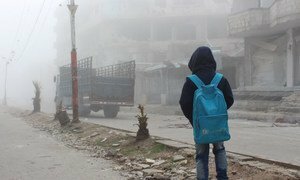 Wrapping up his visit to Syria, the head of the United Nations children's agency has urged both the Government and armed opposition groups to facilitate access to all children in need, especially so the UN and its partners can implement a nationwide immunization programme.